General Hayter was born in Vegreville, Alberta. He received his early education in Vegreville and in Barrie, Ontario. He graduated from the University of Manitoba, with a BA in Political Science. 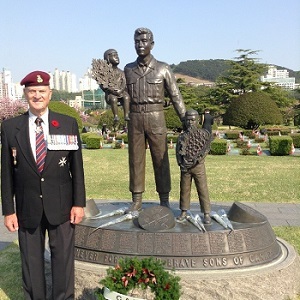 During his military career, which spans over fifty two years in the Regular Force and the Reserves, he served in Korea, Germany, Cyprus, Italy, England, and Belgium, as well as many locations in Canada, including Valcartier, Petawawa, Ottawa, London, Kingston, Toronto, Halifax and Yellowknife, NWT. His first major command was in London where he served as Commanding Officer of 1st Battalion, The Royal Canadian Regiment. His first assignment as a General Officer was Secretary of the Military Committee of NATO in Brussels. On retirement from the Regular Force in 1988, General Hayter was Commander of Canada's military Northern Region - the Northwest Territories and Yukon Territory. He retired from his service career as Honorary Colonel of the Grey & Simcoe Foresters Regiment, in 2009. Following his regular service, from 1987 to 1991, he was President of The Creative Centre for Learning and Development in Niagara, which administers Canada’s only private Military School for boys – Robert Land Academy. From 1991 to 1995, he was President of The Academy of Learning (Niagara), a computer and office skills training centre which he owned in a dual partnership. He also taught Human Resources in the Business Division at Niagara College in Welland, Ontario. • Knight of Justice and Vice Chancellor - Canada, The Most Venerable Order of the Hospital of St. John of Jerusalem, which has its roots in the oldest Order of Chivalry and oldest charity in the world. It is the parent organization of St. John Ambulance, and, Her Majesty The Queen is the Sovereign Head of the Order.